If you have a loved one who is nearing the end of their life due to their advancing age or because of a life-limiting illness, consult with the hospice and palliative care professionals at Americare Hospice. This can be a difficult time for both you and your loved ones, and making the decision to admit them to an inpatient unit near Apache Junction is just another difficult choice you may have to make. 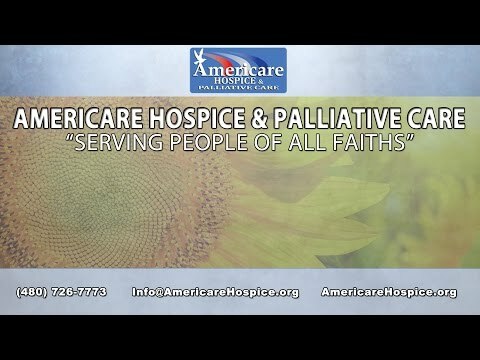 At Americare Hospice and Palliative Care, we are a Catholic hospice center near Apache Junction that can make your loved one’s end of life experience comfortable. Our Apache Junction inpatient hospice facility offers the flexibility warmth your loved one deserves near the end of their life. When you are considering admitting your loved one into hospice care, it is important to find a caring, supportive, and professional hospice organization that will provide the best care for them at the end of their life. Americare Hospice and Palliative Care is an Apache Junction hospice center that offers your loved ones the care and respect they deserve during this difficult time. Recognized and approved by the Diocese of Phoenix by Bishop Olmsted. Deeply value ethics that protect the value of human life. Owned and operated by a family of professional nurses. Home-like and warm inpatient facilities. Full triage nursing care at all hours of day and night. Low turnover rate of nurses and caregivers to offer consistency for your loved one’s end-of-life experience. Respectful spiritual and religious needs for the patient. Americare Hospice is a Catholic hospice center near Apache Junction that provides hospice and palliative care for patients throughout the East Valley. Although we are a Catholic hospice center, we understand our crucial it is that a patient can seek care that aligns with their religious or spiritual affiliation. When your loved one is nearing the end of their life, it is essential that their wishes are respected, whether it is a spiritual accommodation or a separate non-religious request. We implement our top-rated hospice care through respectful, kind, and validating relationships with nurses, caregivers, loved ones, and patients alike. Our Apache Junction hospice facility has a strong philosophy that real care is incredibly important, whether you decide on in-home hospice care, or decide to admit your loved one to our inpatient unit. Americare Hospice provides pivotal care such as pain management and spiritual care to give your loved one a successful experience. An approach that is ethical, morally clear, and supportive of natural processes is also very important for fulfilling end-of-life care. Holistic practices often make the passing of a loved one a more beautiful process. Not only do we provide the best Apache Junction hospice care, but we also offer additional support for the patient’s caregivers and family who are struggling with grief and mourning. Americare Hospice and Palliative Care believes in integrating pain and symptom relief with spiritual respect and fulfillment that involves both the patient and the family. Americare Hospice and Palliative Care is an Apache Junction hospice center near me with skilled nurses who service the entirety of Apache Junction as well as surrounding areas throughout the Valley. Our Apache Junction service areas for skilled and compassionate care for your loved ones include the areas of 85281, 85282, 85283, 85284, and more. Contact our compassionate hospice caregivers today for more information.